The Association of Professional Dog Trainers (APDT) is pleased to announce its quarterly membership magazine, Chronicle of the Dog, has won the category “Annual, Special Interest, Or Any Other Subject” (magazine) through the Dog Writers Association of America annual writing competition. APDT Board Director Sandy Modell accepted COTD’s Maxwell Medallion during DWAA’s annual Writing Competition award ceremony Feb. 10 in New York City. COTD submitted its Summer 2018 and Fall 2018 issues won on its variety of stories on business, legislative issues, and animal behavior, health and nutrition, as well as many others. Last year, COTD won in the Club Publication (magazine) category. 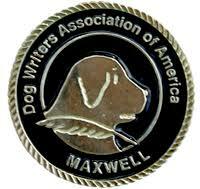 COTD writer, Laura Donaldson, a two-time-nominee in the Behavior or Training magazine article category, received the Maxwell Medallion for her article “Look At That!” published in the Winter 2017 issue. Laura scored her second nomination in that category for the “Behavior Matters” article in the Summer 2018 issue. Under the Graphics (single illustration) category, COTD cartoonist Jeroen van Rossum earned his Maxwell Medallion for his original cartoon on the Delta Airline Emotional Support Animal policy in the Spring of 2018. In the “close but no cigar” section, COTD was nominated for, but did not win in the Club Special Publication for its 25th anniversary edition (Fall 2018). That honor went to the Westminster Dog Show program.